Pakistani Pink Himalayan salt plates, platters, and bricks can be used for sauteing, grilling, chilling, curing, baking, salting, plating, bathing, and contemplating. A boulder of Himalayan salt emerges from darkness of a 16th century mine shaft in Pakistan and explodes into light, catching and refracting the sun in hues ranging from water-clear crystal to clematis flower pink to deep meaty red. The rough salt rocks are then hand cut by local masons into a variety of shapes, providing the foundation for extraordinary new ways to prepare and serve food. Indeed, there are as many uses for a heavy plate of Pakistani Pink Himalayan salt as there are foods, cooking styles, whims, acts of folly, and shows of bravado. The salt’s crystal lattice has a fairly high specific energy, so it will tend to hold any temperature you bring it to for a good while. Also, due to its lack of porosity or moisture (.026%), the salt plates can be safely heated or chilled to virtually any extreme. We have tested them from 0°F up to 900°F. Two other considerations come into play when working with our Himalayan salt plates. Their lack of porosity means that the surface area touches your food is minimal. Compared to, say, ground up salt or naturally evaporated salt crystals, these large plates of salt will impart only a very moderate saltiness. Second, the high quantity of trace minerals (1.2% sulfur, .4% calcium, .35% potassium, .16% magnesium, and 80 other trace minerals) impart a more mild and full taste to the salt, providing another level of flavor complexity to your food. This mineral-rich pink salt plate enhances the flavors of anything placed on it, making it great for grilling steaks and seafood, chilling and serving sushi or beef carpaccio, serving cheeses, curing salmon gravlax—even searing shrimp and scallops table side. Mineral-rich pink Himalayan salt adds delicate flavor to food. HOW TO COOK ON SALT PLATE? Salt plates must be preheated before you can cook on them. The most common method of pre-heating is to put the salt plate on the stove top (not in the oven) and heat it slowly. Khalidmaqbool.com recommends starting on a low heat and gradually turning the heat up about every 15 minutes until the plate of salt reaches the desired temperature for cooking. The salt plates can be used to cook meats, fish, eggs, breads, pizzas and much more. Himalayan salt plates can get very hot and stay that way for a long time. Protect your hands and your kitchen surfaces by investing in a sturdy rack upon which to carry your HPS block. You may also want to get a pair of high-heat resistant gloves. A super-heated salt plate can and will burn your fingers right through most cooking mitts. Instead, I highly recommend leather welding gloves. While this may sound odd, they work extremely well not only with salt plates, but also for safely handling heavy cast iron cookware. If you must use oil, brush it lightly on your food. Oil applied directly to the block will work its way into the cracks. At best, the oil will go rancid and you will have to throw away your salt plate. At worst, it will catch fire and make a pretty spectacle in your kitchen or grill area. Cleaning: If hot, allow your plate to cool completely first. Moisten the salt plate with a damp sponge (do not use soap). Scrub with a soft brush or green scouring pad to remove any stuck matter, and wipe clean with the sponge. Try to keep the plate as dry as possible – the less water the better. Repeat until the plate is free of any cooked on food. Tamp dry with a paper towel or clean cloth, and set on a drying rack. This process removes only a very thin layer of the salt and preserves a relatively smooth surface. Treated with care, a large salt plate can provide dozens of uses. The powerful antimicrobial properties of the salt insure that it is always proper and ready for future use, with no need for detergents. Storing: Store in any location where humidity is at a minimum. I keep many of mine on the windowsill. If you live in a humid climate, wrap the plate in a towel and put in the cupboard. A Himalayan salt block is a large piece of pink salt, hand carved and formed into a plate. They are carved into rectangles, circles, squares, or other neat brick-like shapes. Each block is one of a kind, and can be rough or smooth, but probably a little of both. They are a very unique way to prepare and serve vegetables, seafood, chicken and even cold dishes like raw fish. Not to mention it will add to the conversation of any dinner party. The best part is that the block is actually healthy for you. Himalayan Salt blocks make a wonderful up scale statement when used to serve and display your foods such as sushi or cold meats and cheeses. They are most often also used for cooking on the stove top, in the oven or on the grill to cook steak, chicken, seafood or vegetables for a delicious flavour and tender meat. Himalayan pink salt blocks are harvested from deep within the ancient Himalayan mountain range, completely untouched, making it what many consider the purest, cleanest salt in the world. This is a step-by-step guide for cooking on a Himalayan salt block. Cooking steak is one of the easiest ways to start using your Himalayan salt block. The process is the same for other foods – the only thing that changes is the cooking time. If you don’t eat meat, you can substitute any of your favourite vegetables. For more information, check out our complete Guide to Himalayan Salt Blocks. I love the infra red thermometer — it worked great! I imagine I will be using it in the kitchen to measure the temperature of other cooking surfaces as well. Since salt is anti-microbial (it doesn’t grow bacteria) the block will technically be considered clean once it has time to cool off and dry. Once the block has cooled overnight use a wetted stiff bristle brush and scrape off any stuck on or burnt food. Let block dry completely for 24 hours before reusing. Do NOT hold block under running water as it will cause the salt to dissolve. 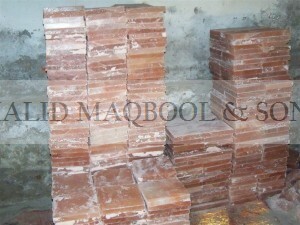 Pakistani Pink Himalayan salt blocks, plates, platters, and bricks can be used for sauteing, grilling, chilling, curing, baking, salting, plating, bathing, and contemplating. Indeed, there are as many uses for a heavy block of Himalayan salt as there are foods, cooking styles, whims, acts of folly, and shows of bravado. The salt’s crystal lattice has a fairly high specific energy so it will tend to hold any temperature you bring it to for a good while. Also, due to its lack of porosity or moisture (.026%), the salt plates can be safely heated or chilled to virtually any extreme. We have tested them from 0°F up to 900°F. Two other considerations come into play when working with our Himalayan salt block. Their lack of porosity means that the surface area touches your food is minimal. Compared to, say, ground up salt or naturally evaporated salt crystals, these large blocks of salt will impart only a very moderate saltiness. Second, the high quantity of trace minerals (1.2% sulfur, .4% calcium, .35% potassium, .16% magnesium, and 80 other trace minerals) impart a more mild and full taste to the salt, providing another level of flavor complexity to your food. 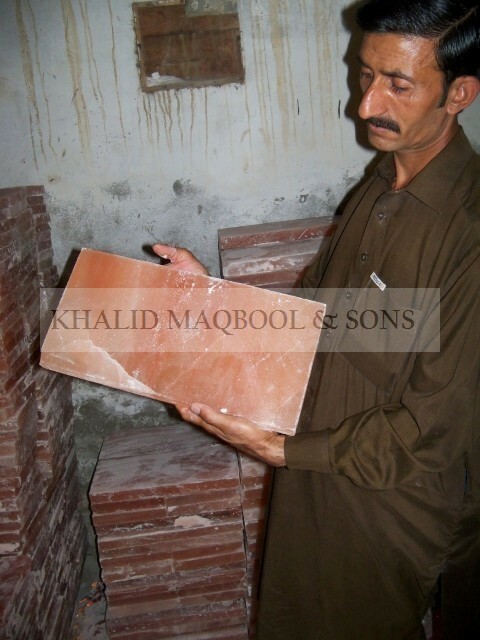 Khalidmaqbool.com are pioneers of Himalayan salt block and our Salt blocks are the highest quality you’ll find anywhere. Several mines produce Himalayan salt block, each with subtly different characteristics and qualities. We have worked tirelessly to find the best source of salt, and evaluated dozens of local artisans to find the ones who can produce the highest quality salt block. Salt block is sourced from natural salt deposits found in the Himalayas. The dense crystalline composition adds complex flavor to all types of foods. Heat on the grill to sear seafood and meat, or chill for serving a selection of fruits, vegetables and cheeses with a hint of salt. Salt blocks must be preheated before you can cook on them. The most common method of pre-heating is to put the salt block on the stove top (not in the oven) and heat it slowly. Khalidmaqbool.com recommends starting on a low heat and gradually turning the heat up about every 15 minutes until the block of salt reaches the desired temperature for cooking. The salt blocks can be used to cook meats, fish, eggs, breads, pizzas and much more. Please note: The salt blocks are a natural product and do vary slightly in color. Because salt blocks are made of salt and not stone, and need to be heated and cooled extremely carefully, we can’t guarantee against cracking during heating. The main thing is to buy a salt block that’s appropriate for the intended use. If you’re going to be using it for serving, curing or for chilling, you can buy a grade of salt block that has more irregularities and fractures with crystalline imperfection. It’ll be very, very beautiful, but not as structurally rigid as a salt block that you might need for cooking.